Coconut water is the natural refreshing drink which is slightly sweet in taste. Here am going to make a yummy dessert using coconut water. You can also use tender coconut water (ilaneer vellam) instead of coconut water. 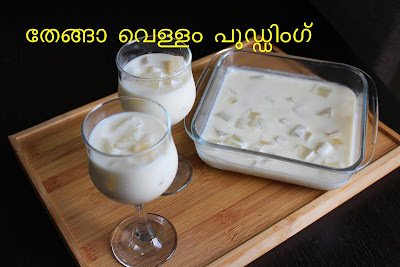 As in Kerala, gods own country coconut is in abundant, you can easily make puddings or desserts using this coconut water. I love adding the different forms of coconut in most of my recipes as well. Like scraped coconut, grated coconut, coconut milk, dry coconut powder, desiccated coconut, etc. I love the combination of coconut water and coconut milk in my desserts recipes. In this pudding recipe, the coconut water crystals are prepared ahead and then it is added to the coconut milk mixture which is creamy in texture. Really this dessert recipe is a must try dessert or pudding recipe for sure. Don't forget to drop your valuable feedbacks. Prepare the first layer. 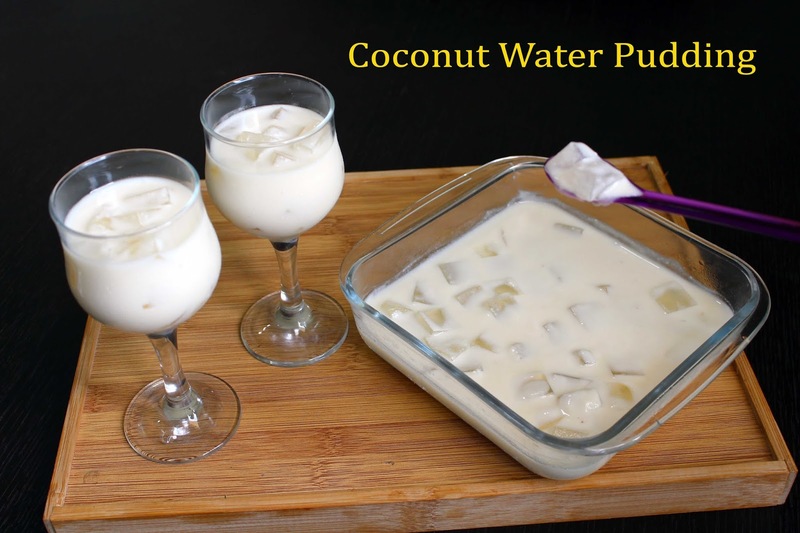 Use sweet coconut water for making this pudding. Heat coconut water in a pan. Meanwhile, melt the chinagrass along with some water in another pan over a low flame. Add sugar to the coconut water mixture and mix well. Once it starts to boil add the melted chinagrass to this mixture through a strainer and combine well. Cook for a minute and then remove from flame. Immediately transfer this mixture to a pudding tray. Keep it in the refrigerator for 2 hours or until it set. After 2 hours or once the pudding set, cut it into small cubes and then keep it in the refrigerator until the next layer becomes ready. So I am going to make the other layer in this same tray itself. .Boil the thick coconut milk and coconut water in a pan over a medium-low flame. Then add condensed milk and mix very well. Once it is hot, add cornflour mixture (mix cornflour with some water) and allow it to boil. It will start to thicken soon. Once it becomes slightly thick, remove from flame. Transfer this mixture to the pudding tray and allow it to cool slightly and then add the prepared crystals (coconut water cubes) and combine well. You can serve immediately or can chill and serve in a serving cup.